Located next to the church, St John’s Cemetery was established in 1839 – the same year our historic church building was itself constructed. Our cemetery operates under regulations covering the sale of interment rights, installation of monuments and care of grave sites, as well as the overall day-to-day management of the cemetery. Under these rules, the cemetery is administered by a cemetery board including the incumbent (rector) of the Parish, both wardens and three members elected at the church’s annual meeting, one of whom acts as chair. The board appoints its treasurer, secretary and a superintendent of the cemetery responsible for ongoing care and maintenance. The excellent and beautiful condition of our cemetery is because of the hard work of our Superintendent and his assistant, whose contributions are gratefully acknowledged. Who may purchase interment rights? The cemetery was established for the congregation of St John’s. Both current and former members of the congregation who are currently (or were) contributors to the church may purchase interment rights. The first interment of a person who is still buried here was that of Jane Gainford on August 23, 1839. In the early 1920’s a group of interested people, including L.E. Stanley, Thomas Watt, Alan Armstrong, Ida R. Armstrong, George Reed and Joseph Harwood did significant maintenance work to improve the condition of the graveyard. They also initiated an endowment fund to pay for the upkeep of the cemetery on a continuing basis. In 1928, Robert Richardson gave an additional parcel of land to the rector and wardens of St John’s which almost doubled the size of the cemetery. In 1938, the St John’s Memorial Cemetery Fund was incorporated by letters patent and control was through recommendations approved by the church’s annual membership meeting (Vestry). This method of administration continued until 1960 when the new Ontario Cemetery Act laid down specific conditions for perpetual gravesite care – requiring that a certain percentage of the money from sale of interment rights be placed in a trust fund, and the interest used exclusively for the care and maintenance of the cemetery. Parish members passed a motion in 1990 supporting expansion of the cemetery, leading to 396 new gravesites being laid out. In June, 2005, a 24-niche columbarium for cremation urns was installed in the cemetery, thanks to a bequest from the late Col. John Woolsey, a long-time member of the cemetery’s board. A second columbarium was installed in 2013 funded by a bequest from the late Jean Mooney to the cemetery. In 2003, the Friends of St John’s Cemetery was established to encourage regular financial support of the cemetery. An annual appeal for donations is made yearly on Memorial Sunday (usually the second last Sunday in June). Donations for the maintenance of the cemetery are gratefully received at any time. In 2016, a special project was initiated for the installation of a gazebo to provide a shaded sitting area on the cemetery grounds. The gazebo is to be funded by memorial donations from members of the congregation, those who have family interred in our cemetery, and others with connections to our church. Fund raising continues. Where any donation is made in memory of a loved one, and if the donor wishes, a special record is entered in the Memorial Book kept in the church, noting the name of the person or persons in respect of whom the donation has been made. Cheques should be made payable to St John’s Anglican Church with a notation that the funds are for the cemetery. or by telephoning the Parish of March Office: 613-592-4747. Please click here to see a brochure about St John's Cemetery, and the fees and charges in effect as of April 2017. 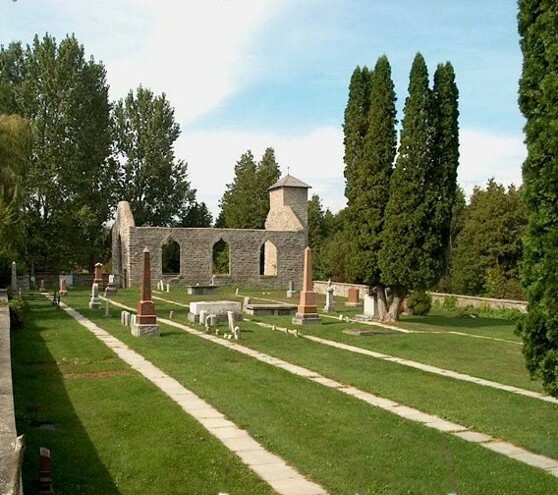 St Mary's cemetery is located in the ruins of Old St Mary's at Pinhey's Point. Although Old St Mary's has been torn down and a new St Mary's has been built, the cemetery is actively being used by the congregation of the new St Mary's. St Mary's cemetery is governed by the provincial cemeteries act and by a board that consists of members of the congregation and the Incumbent. Grounds maintenance is the responsibility of the board. Pinhey's Point is a historical site and the City of Ottawa conducts guided tours to the manor and to the cemetery. We are extremely thankful that the City of Ottawa assists with cutting the grass in return for the ability to conduct the tours. Although the cemetery walls and the walls of Old St Mary's are on the cemetery grounds, their maintenance cannot be covered under burial agreements. Monies paid for burials must be directed towards the maintenance of the grave sites. Stabilization of walls and the remains of Old St Mary's must be funded separately. Keeping these walls and remains safe and preserving them for future generations is very expensive. Therefore donations towards St Mary's cemetery are very gratefully received and will be put to immediate use for preservation and stabilization of the site. Members of the congregation may direct some of their weekly givings by marking the envelopes with the word Cemetery and the amount. Donations may also be made by contacting the chair of the St Mary's Cemetery board at the address and phone number listed below under Enquiries. St Paul’s is part of the 3-point Parish of March. As the area began to prosper and the population grew beyond the river, a meeting was held in 1894 to establish a church in Dunrobin. Stone was drawn from Henry Vahey’s quarry by parishioners. The church was completed in 1896 and paid for by 1900. 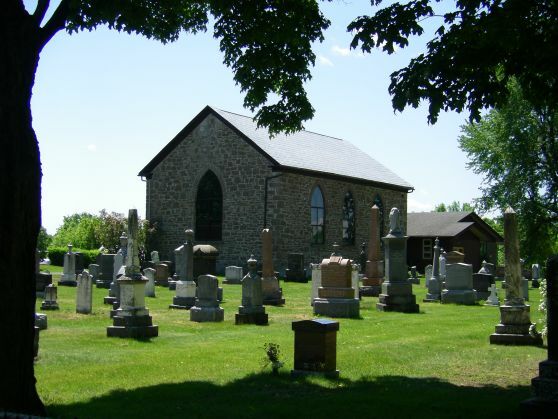 Located at 1118 Thomas Dolan Parkway, Dunrobin ON, K0A 1T0, Part of Lot #27, Conn. 3, Township of March, the Cemetery is part of the church grounds and is located on the north side of St Paul’s Church. Our cemetery operates under the Ontario Ministry of Government Services, Cemeteries Regulation Unit, covering the sale of interment rights, installation of monuments and care of grave sites, including a Care & Maintenance Trust Fund, as well as the overall day-to-day management of the cemetery. Under these Cemetery Act rules, the cemetery is administered by a cemetery superintendent under the direction of the church council, including the incumbent (rector) of the Parish and both wardens. The council appoints a superintendent of the cemetery who is responsible for burial plot location and preparation, along with ongoing care and maintenance. The excellent and beautiful condition of our cemetery is due to the hard work of our superintendent, assistants, and congregational members whose contributions are gratefully acknowledged. The cemetery was established for the congregation of St Paul’s. Both current and former members of the congregation who are presently (or were) contributors to the church may purchase interment rights. Anglican residents in the community of Dunrobin may also purchase plots upon approval from council. Pricing is reviewed on a regular basis and is approved by St Paul’s council. Plots are priced according to membership status: St Paul’s members and their children, direct parish relatives, and non-parish members. St Paul’s Cemetery is 1/8 acre (225' x 100') and part of the church grounds. The earliest plot sold, was April 24, 1900 for $6.00. As of April 13, 2010 there are 103 recorded burials. World War I veterans are remembered on a stone cairn in the cemetery. Among those mentioned are Walter J. Bishop, Howard E. Davis and several drowning victims. 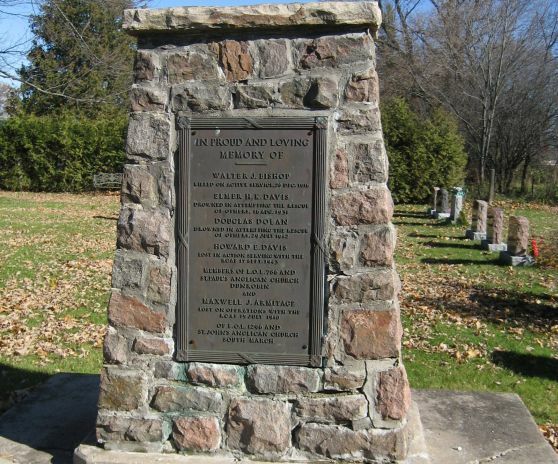 Prominent Dunrobin community members buried in St Paul’s are the Hobbs, Dolan, and Wilson families whose pioneer history is recorded in the historical book “Torbolton by the River, Volume II”. St Paul’s holds an annual Memorial Service in early August to remember loved ones passed and is open to anyone wishing to attend. Dates for this service can be found on the parish calendar within this website. Cemetery or Memorial donations can be made payable to St Paul’s Anglican Church with a notation that the funds are for the Cemetery or Memorial. A receipt for Income Tax purposes will be issued for these donations when name and address is provided.